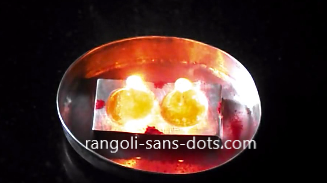 Place kundan stones of matching colours and shape as shown in the first image. 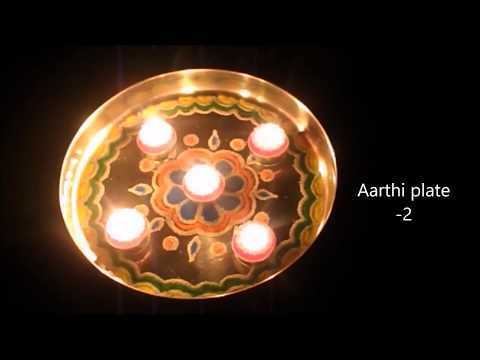 Using a cotton bud form patterns that resemble the barbs of the feather. 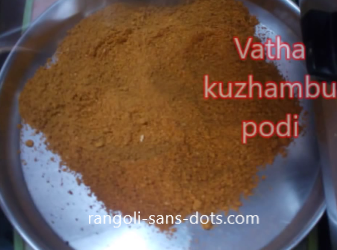 We can either leave the kundan stone as it is or we can remove it and fill with an appropriate colour. 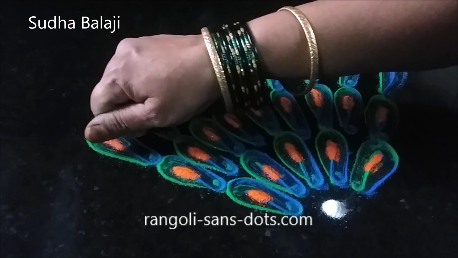 When we add the different colours around the kundan stone we have to be a bit careful to avoid them getting smudged or one colour falling on the other. Similarly while dragging the bud away to form the patterns we should do it in a relaxed manner with our wrists not stiff . 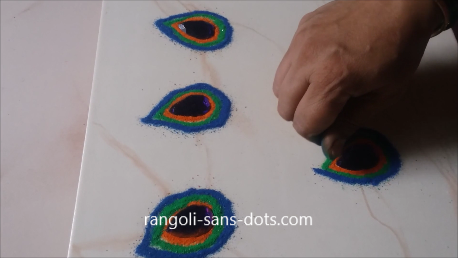 Otherwise this is one of the easiest methods to draw a peacock feather for rangoli designs that are usually drawn during Diwali or Sankranthi. 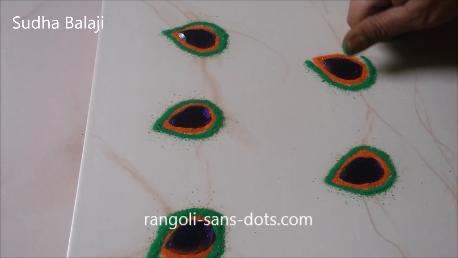 This can also be used to draw a single peacock feather rangoli the easiest way ! If the previous method was simple this is even simpler , I feel. Choose two colours from the shades of blue and green. Draw a small line with one colour and draw the next line such that both are juxtaposed and touching each other . 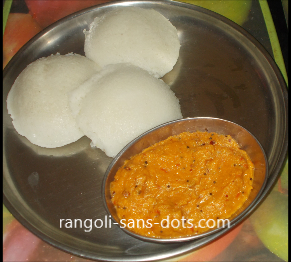 The image below should give an idea. 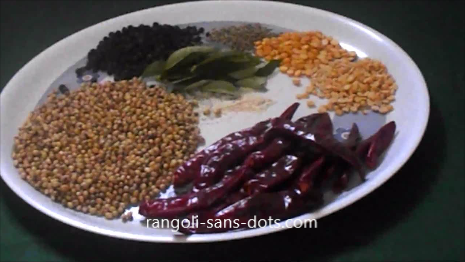 Using the index finger form patterns as shown in the picture below so that both the colours blend and we get the shape of peacock feather. 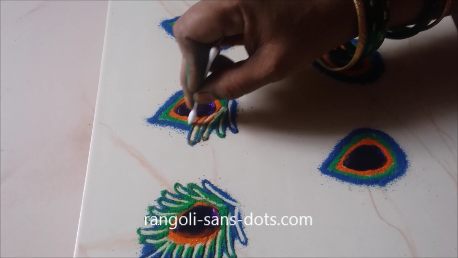 Fill with orange colour to complete the eye of the feather. 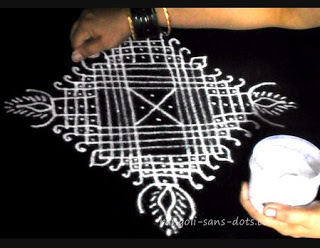 Using bud form patterns as shown in the picture below to represent the barbs of the feathers. 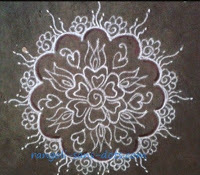 The rangoli is complete. We can fill the gaps among the feathers with blue and green colours. 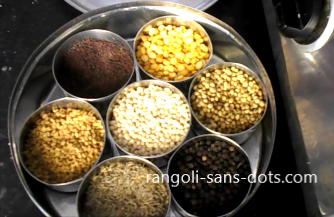 Sprinkle them with the fingers in the gaps. 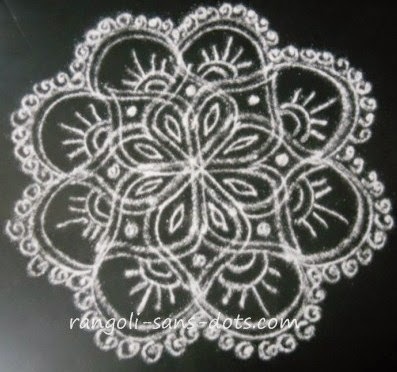 These two methods may be useful for peacock rangoli designs for competitions in schools and colleges that they usually have before or after Deepavali. 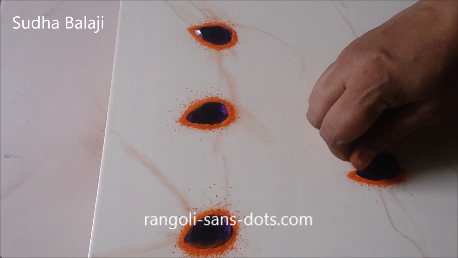 So these two methods can be used to represent the main parts of a peacock feather in a rangoli !